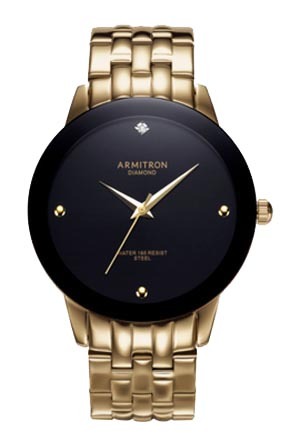 If you’re a fan of high end watches, the Armitron brand may have eluded you. It’s a mass-market product, to be sure, but Armitron watches have been among the biggest-selling brands of timepieces in the United States for decades. Founded in 1956, the company specializes in sporty, attractive, affordable timepieces for the mass market. That’s not a slight; that’s their target market. While they are somewhat of a commodity as watches go, they’re perfectly serviceable watches that look good and perform well at a great price. Read on for the full Armitron watches review. The build quality is good, though not exceptional. Water resistance for most models measures in the 30-50 meter range. Effectively, that means that the 30 meter models may get wet, but you shouldn’t spend time in the water with them. The 50 meter models are suitable for wearing while swimming. Cases are made from stainless steel, and the face is protected by mineral crystal, which is hard, but not impervious to damage. Watches are available with both stainless steel bands and leather straps, and some of the models feature simulated rose gold. The majority of the company’s models have quartz movements, and most of those are sourced from Japan. Quartz movements are highly reliable as well as highly accurate in keeping time. They’re also relatively maintenance free. 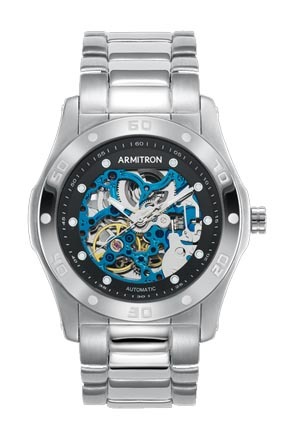 A few models in the men’s line of Armitron watches also feature automatic movements in a skeleton design so that you can see the moving parts in action. The company’s watches are assembled in China from parts sourced from there and elsewhere. 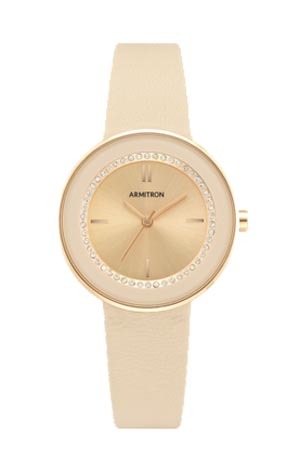 Click here to shop for Armitron watches at Amazon. At the price range offered, you’re not going to find cutting edge innovation, but you’ll find a nice variety of features, including day/date calendars and chronograph features. Styling is fairly broad. You’ll find models that are suitable for wearing to work or out on the town. The company also features a number of sports watches that include increased water resistance and chronograph features. Models are available with both digital and analog displays, and the company makes a broad variety of styles and models, offering roughly 50 models for men and about 65 models for women. That’s enough models that most everyone should be able to find something that they like in the product line. You’ll find a little bit of bling in the product line, though it’s largely faux bling. Some models feature faux rose gold stainless steel cases, and a few of the women’s models feature Swarovski crystals, so if you like your watches on the shiny side, you’ll be at home with this brand. There’s a bit of color in the product line, as well, which means that you don’t have to settle for the common colors of black, white, or silver on your faces. As the majority of Armitron watches are powered by quartz movements, you won’t have to worry too much about maintenance. Quartz watches are powered by batteries that will need to be replaced every couple of years, and this is something that can be done in a few minutes by any major jeweler or retailer. You should store your Armitron watches away from extremes of temperature and keep them away from strong magnetic fields, as this can damage the movement. Most models are not suitable for prolonged exposure to water, so if you get your watch wet, be sure to dry it thoroughly as soon as possible. With proper care and storage, you should get a number of years worth of use from your watch. While Armitron watches are relatively low-end timepieces, they come with one of the best warranties in the industry. Actually, it would be hard to come up with a better warranty, as they are warranted for life against defects in craftsmanship and materials. That’s an impressive warranty, given that the industry standard warranty is for two years, and that’s often true even for watches that sell for tens of thousands of dollars. If you’re looking for a model where you know the company will stand behind it forever, then this brand would be a good choice. As watches go, you’ll find this brand to be reasonably priced. The bulk of the company’s watches fall into the $50-$150 price range, making them affordable for just about anyone. When you combine the price and the lifetime warranty, you’ll find that this brand represents quite a bargain as timepieces go. You won’t spend much money but you’ll likely get years of service from it. These watches are among the most ubiquitous on the market; you’ll likely find them for sale just about anywhere that wristwatches are sold. You can find them at major department stores, big box stores, and through a number of vendors online. While not every retailer is likely to carry the entire line, which currently includes more than 100 models, most retailers that carry the brand should have a good representative sample in stock. If you’re looking for a luxury brand of watch that includes gold, platinum or diamonds, you’re going to have to look somewhere else. That’s not what this brand is about. What they’re about is offering a stylish, attractive timepiece that’s available in a wide variety of designs at a price that nearly anyone can afford. Then the company tops it off by offering one of the best warranties in the industry. The result is a watch that is diverse enough and affordable enough that you’ll likely want to buy more than one. They have sports models and models that are suitable for a fancy evening out, and you’ll find that they’re stylish enough for any occasion. If you’re looking for a great-looking timepiece that’s reliable and affordable, Armitron watches would be a good choice.